Just one of the numerous Senran Kagura projects from franchise creator Kenichiro Takaki, and studios Tamsoft, Marvelous and Honey ∞ Parade Games, Senran Kagura: Peach Beach Splash is a PS4-exclusive team-based shooter with a seaside twist; Peach Beach Splash retains the frantic action of the core series, but instead of settling their rivalries in the streets and dojos, 30 of the franchise’s ninja-schoolgirls are once again thrust into a tropical paradise, this time engaged in a chaotic water-gun tournament. Depending on how aggressive players are in the heat of battle, each weapon in their loadout can potentially increase in potency as the match progresses; weapons can increase in damage and efficiency up to four times before the match ends. Similar to Titanfall‘s own pre-match “Card” mechanic, Peach Beach Splash employs its own assortment of gameplay-adjusting Cards, capable of boosting each character’s stats, granting perks to the entire team, or allowing the player to summon a temporary “pet” to aide them on the battlefield. Once players have tuned their skills in the single-player “P-1 Grand Prix” tournament, Peach Beach Splash offers several online modes, including Deathmatch, Queen of the Hill and Co-Op Survival. Earlier today, Tamsoft and Honey ∞ Parade Games issued update 1.0.3 for Senran Kagura: Peach Beach Splash, alongside the “Valkyrie Drive: Bhikkhuni Character Set” DLC pack (includes Bhikkhuni characters “Rinka” and “Renka”) for European and Australian audiences. 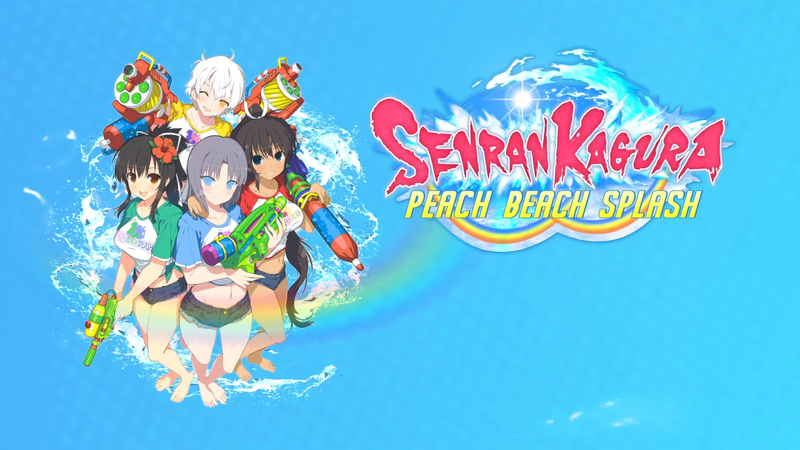 The primary purpose of today’s update enabled content-parity between the European and Japanese versions, allowing online players to use DLC characters against international opponents who may not own the extra characters themselves, however the new patch also enabled a previously missing feature; a gameplay element advertised but not present at launch, Senran Kagura: Peach Beach Splash now supports PlayStationVR. Peach Beach Splash does not allow for actual matches to be viewed in VR, but the new 1.0.3 update adds two new VR-ready modes- VR Character Viewer Mode and VR Diorama Mode. These expanded versions of the Dressing Room mode allow PSVR owners to physically interact with and customize all 30 characters in virtual-space, and create a custom “diorama” from preset environments and a maximum of 3 characters sporting a variety of poses. Senran Kagura: Peach Beach Splash is available exclusively for the PS4; a PlayStationVR headset is required to experience VR Character Viewer Mode and VR Diorama Mode in their intended manner. Those who may not have access to the PSVR but still want a more….personal experience with the Senran Kagura universe can pick up the HD-Rumble-enabled Shinobi Refle: Senran Kagura for the Nintendo Switch.